Radar by Tiny Pictures is a combination online photo-sharing tool and social community. Like most social networks, you can “friend” people on the Radar network, and comment on each other’s photos and videos. On My Radar: Radar combines online photo-sharing with social networking features. It’s an interesting idea, but the app’s interface can be an acquired taste. 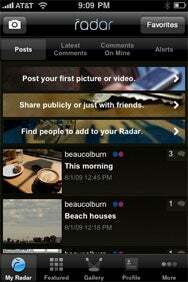 Radar also allows you to link to other popular social networking and photo sites like Flickr and Twitter. Once your accounts are linked, you can view and comment on photos from within Radar. You can also upload new photos and—if you happen to be an iPhone 3GS user—videos directly to Radar; you can send them to Twitter and Flickr at the same time, if you so choose. During my testing, I had a few issues with both the app and the Radar concept in general. First, Radar has the feeling of a new social network that simply sits on top of other existing networks. As a Radar user, you can link your Flickr photo stream to your Radar account. If you have a contact that is is both a Radar and Flickr user, their photos (comments and all) will show up within Radar. You’ll be able to comment on a photo viewed in Radar, and have it written back to Flickr as well. This functionality could be helpful as the Radar community grows, but right now it’s not offering me anything beyond what I find in the Flickr community. I also didn’t care for Radar’s overall interface. I found it hard to read, and overly busy. While Flickr takes care to leave a lot of white space around photos, Radar takes the opposite approach. All the images sit tightly on top of each other, making them hard to distinguish. I take a lot of care with the photos online, so I’m not terribly impressed to see them presented this way. Social photo sharing is a fun practice. And as more mobile phones sport more sophisticated cameras, the practice is only going to gain momentum. While Radar offers some one-stop integration, it really doesn’t do enough to distinguish itself from other, better offerings. I find I’m able to get what I need from existing services without adding another social network on top of them. Radar is compatible with any iPhone or iPod touch running the iPhone 2.1 software update.